In 2017 they convened at David's home in the Pacific Northwest to create this recording. 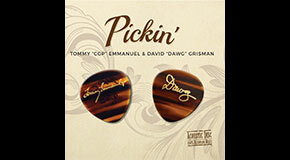 At Tommy's request, they recorded 10 Dawg compositions, including five new tunes — ”Standing Rock", "Farm & Fun Time”, "Port Townsend Blues”, "Zorro's Last Ride" and "CGP & Dawg” (written expressly for this project). Five Dawg standards, “Sweet Georgia Brown” and Tommy’s beautiful arrangement of “Waltzing Matilda” complete the program. An exuberant meeting of musical souls, captured (in the living room) by Dawg's long-time friend and recording engineer extraordinaire, "dB" Dave Dennison, these performances exude spontaneity as well as great nuance and depth in what promises to be an important, long-awaited and historic musical friendship.